Shifting cultivation has traditionally been practiced in the Democratic Republic of Congo (DRC) by carving agricultural fields out of primary and secondary forest, resulting in the rural complex: a characteristic land cover mosaic of roads, villages, active and fallow fields and secondary forest. Forest clearing has varying impacts depending on where it occurs relative to this area: whether inside it, along its primary forest interface, or in more isolated primary forest areas. The spatial contextualization of forest cover loss is therefore necessary to understand its impacts and plan its management. We characterized forest clearing using spatial models in a Geographical Information System (GIS), applying morphological image processing to the Forets d'Afrique Central Evaluee par Teledetection (FACET) product. 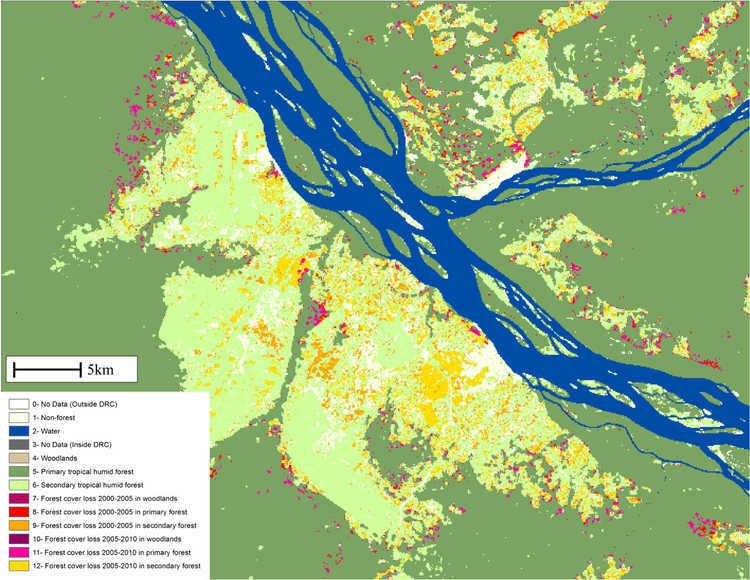 This process allowed us to create forest fragmentation maps for 2000, 2005 and 2010, classifying previously homogenous primary forest into separate patch, edge, perforated, fragmented and core forest subtypes. Subsequently we used spatial rules to map the established rural complex separately from isolated forest perforations, tracking the growth of these areas in time. Results confirm that the expansion of the rural complex and forest perforations has high variance throughout the country, with consequent differences in local impacts on forest ecology and habitat fragmentation. Between 2000 and 2010 the rural complex grew by 10.2% (2 771 238 ha), increasing from 11.9% to 13.1% of the total land area (1.2% change) while perforated forest grew by 74.4% (1 431 355 ha), from 0.8% to 1.5%. Core forest decreased by 3.8% (3 291 142 ha), from 38% to 36.6% of the 2010 land area. Of particular concern is the nearly doubling of perforated forest, a land dynamic that represents greater spatial intrusion of forest clearing within core forest areas and a move away from the established rural complex.